As a non-profit organisation, HCP is highly dependent on member contributions to continue promoting contemporary photography through its programme of exhibitions, educational activities and events. Becoming a member or renewing your membership is easy. The Hellenic Centre for Photography offers you the opportunity to become a member from this web site. 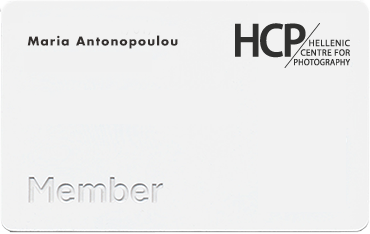 You can also give an HCP membership as a gift. The recipient can enjoy the benefits of membership for an entire year. Choose to give the gift personally or have it delivered directly to the recipient’s address. If you are buying membership for someone else, add their full name, address and email to the membership form. You can also request more information by filling out an online contact form.